Real estate in Tenerife Spanish property jargon. The glossary for Spanish real estate does not show condos or flats, as those words are not used in Tenerife real estate. You may see casa de vacaciones Tenerife in rare instances which is a holiday home in Tenerife. Did you come here by mistake? Do you rather want to see a resort property to buy? Here is a stunning Los Gigantes property going cheap directly from owner, as he already works on another island. There is also the Tenerife apartment Apartamento Tenerife Panorama Puerto Cruz Realejos in holiday resort. Apartment sale for only € 49000 negotiable for health reasons. Real estate in Tenerife Spanish terms translated and more. Una casa is a house that may be anywhere while estar en casa also means to be at home, by the way. Una casa rural is a house in rural area. Una casa adosada is an attached Tenerife townhouse. It may be modern or, a simple older type townhouse. At least 2 townhouses are attached side by side to make up 'adosadas'. Depicted is a row of modern townhouses called Adosadas. They take up a big chunk in real estate in Tenerife. The inside and outside features of them vary. Usually, they come with small balconies. represent top Spanish architecture in residential areas. However, they almost always have roof gardens (azoteas) with penthouses called aticos. An interesting article is dealing with the relation of azoteas and penthouses. Read a review of a penthouse near Puerto de la Cruz...It may be an apartment of any size. A penthouse called ático in Spanish is always on the last floor. No other apartments are above it. Some Tenerife áticos are on top of a flat roof building. The private grounds around a newish townhouse are rather small. Not all have garages. Some have a backyard patio. Olden day townhouses have indoor patios and sometimes also back gardens like some old amazing townhouse in la Orotava Tenerife . Some, even have a cellar in the basement. Some have a tiny front garden. Others are paved up in front. Una casona was the term for a big, luxury house or mansion used by the upper class in the past. However, mansions are usually free standing. Mansions as well as casonas are hard to get today. 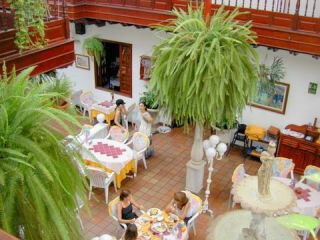 only a small part of the very large indoor patio of the restaurant La Casona Tenerife with its tables and a fountain. This is typical for a casona. 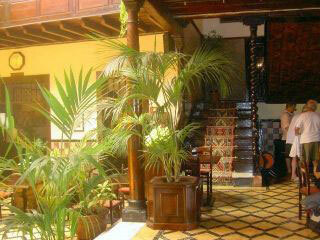 This casona belongs to antique real estate in Tenerife. small hotels nowadays like the one in the picture below. Real estate agents have rather large fincas in Tenerife (farms or country estates) on their books, today. They may be turned into country hotels or anything else which makes good business for tourism. Casonas are rare jams to get hold off for purchase but, are, at times, available for business rent. This casona is also a casa adosada (townhouse) because, there are a row of casonas attached to each other. All this is right in the hub of the oldest Tenerife resort in the north of Tenerife in Puerto de la Cruz in Calle Quintana. Un chalet is a more luxury house with garden around it, usually. It may also be called a villa in English. Un apartamento is a Tenerife apartment living unit which is normally found in apartment buildings. Apartments in Tenerife don't have more than 2 bedrooms. The word pisos is usually applied to larger apartments. Tenerife apartments have a kitchen and, 1 or 2 small bathrooms, usually. A balcony is normally part of it. Please, note that private living units are rarely on ground floors in Spain. The exception are, generally, village townhouses that are often attached, hence adosadas. Un estudio is a studio which may be similar to a condo. A studio is generally the smallest living unit of real estate in Tenerife. A studio is very often a small self catering apartment or, a self service flat in American terms. Not all studios in Tenerife are fully equipped. 99% have basic interior which include at least hot plates and fridge as appliances. Not only the modern resorts by Las Americas and Los Christianos offer many studio apartments. Puerto de la Cruz central has many. 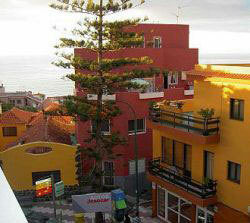 See some photos of different types of self catering Tenerife apartments, very close to the oldest Tenerife resort. The latter serve tourists and residents who want a different setting, which is less touristic. A studio in Tenerife may have an open plan American kitchen inside the living room. I have seen a studio that had 3 cupboards with a couple of built in hot plates as well as a sink and, a small fridge within the entrance passage. 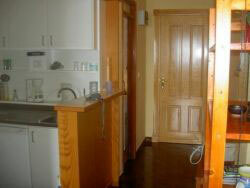 The kitchen may be semi separate like in this picture which is more rare. This kitchen can't be seen from the living room. A studio may have a separate full bathroom. However, it may only have a shower cubicle, toilet and, wash basin. The smallest studio I have seen had 26 square meters. Un estudio apartamento is a studio apartment. It is very much like the normal studio but, it has a separate room or alcove for sleeping. Un solar is a piece of ground of real estate in Tenerife which may be for private purpose or, for commercial use. It is ground where building is allowed. Besides, it may be the mansion or home of a noble or famous family or person. Una finca is usually a rural house or, a farmstead. The finca may also just have a ruin or more. A finca may be by the coast as well. When something is being planted around the farmstead which might even be a villa then it's still called a finca. Los Realejos in the north has some beautiful fincas by the coast. Even a hotel may be classified finca. Un viñedo is a vineyard. Una mansión is a mansion. Un hotel, hoteles stands for a hotel, hotels. Una pensión is a small guest house. Real backpacker hostels are very rare in Tenerife. The Refugio del Teide is a backpacker establishment very close to Mount Teide. Information on the Backpackers' lodge 'Refugio del Teide' may be found in page`for do it yourself Teide tours. Una casita is a cottage. Una cabana is a shed. Una cueva is a cave where Guanches the former inhabitants of Tenerife used to live. I have seen a few cabanas not far from Agua Mansa on the Orotava Teide mountain road. One of the cabanas burned down in the forest during Tenerife wildfires in 2007. One could see the cabana's debris and left overs of furniture in a Tenerife newspaper. Tenerife apartments are often in new buildings that have a name. Such a building is then called Edificio (building) Carmen or whatever. Please, note that you must never forget to write down the name of a building in postal addresses... Street names and numbers are often hard to find by a postman. He is rather orientating himself with names of buildings or, bars nearby. That may sound funny, but, it's true. Here, you see a red Tenerife apartment building which is not old. To the left of it is a lovely yellow painted 'casita' (small house). By the way, apartments are often called pisos or viviendas all over Spain. In Tenerife the term apartamentos which means apartments is rather used for a flat that has not more than 2 bed rooms. The terms 'en alquiler' or 'se alquila' are used for real estate in Tenerife or in any Spain provinces. It may also be applied to commercial properties or other goods. Alquiler por corto plazo (for less than 6 months or 183 days) is the term used for short term, i.e. 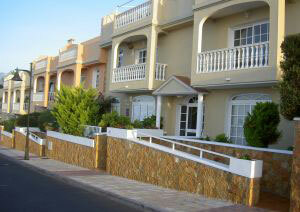 holiday home in Tenerife rental. Se alquile or en alquiler por largo plazo starts with letting more than 182 days in regard to property lets. Tenerife Property guide for selling again, with translated terms. Tenerife mortgages are called hipotecas. 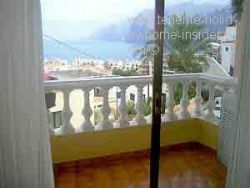 Property in Tenerife Update on Property in Tenerife holiday home in Tenerife situation 2009 which includes super low mortgage rates of almost 1 pc. You should not encounter any racism related problems when you want to buy a holiday home in Tenerife, buy commercial property or, when renting real estate in Tenerife. Not to squeeze prices too much will help also, of course. House flipping and its Tenerife law. Take Tenerife property chance or not? Holiday Villa Tenerife renovation review. In case you have not clicked above on townhouses in La Orotava would you like to see some great photos? Traditional Tenerife townhouses inside where you can also get an idea on how wealthy people were living in past centuries. Go to Tenerife photos Abaco... to see Tenerife historic interior decorating as well as former gracious living of an elite country estate. Why there is a shortage of luxury apartments in Tenerife which means apartamentos de lujo and where to find them is only a review. A holiday home hunt review. The word 'residencia' (residence)and related expressions are not used in real estate in Tenerife Spanish terms. It is only applied to an old age home (residencia de tercera edad) or for on campus student accommodation. One calls everything by its proper word in Spanish as outlined above or, one uses the term 'propriedad' which is property or 'inmobiliaria' which is real estate. However, the same terms are not used when applied to taxes. The Spanish language can be a hard nut to crack when it comes to real estate in Tenerife. From real estate in Tenerife back to HomePage Tenerife holiday home insider.